Thomas scores 17 points in 19 minutes in his first game following a hip injury suffered with the Celtics. 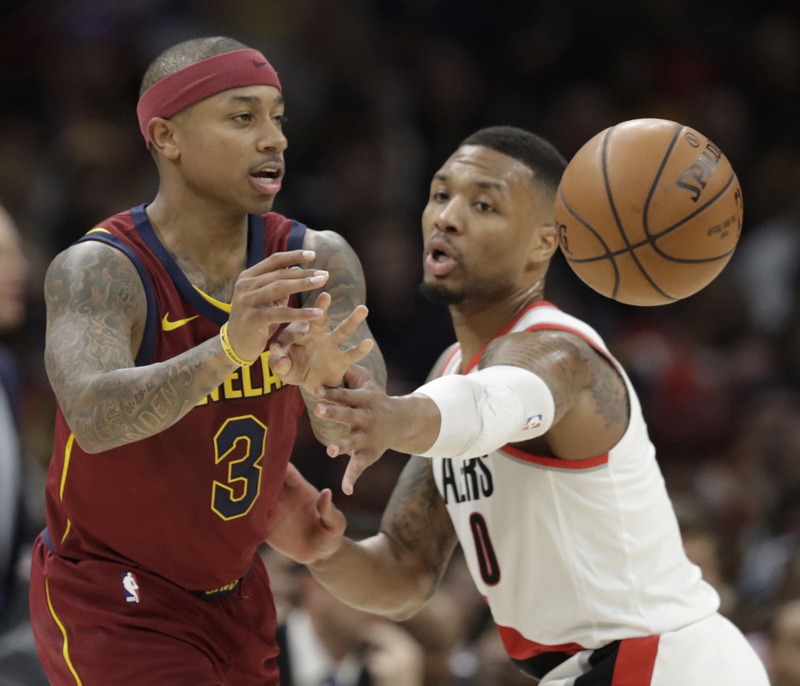 CLEVELAND — Isaiah Thomas showed flashes of what made him an All-Star in his long-awaited Cleveland debut Tuesday night as the Cavaliers snapped a three-game losing streak with a 127-110 victory against the Portland Trail Blazers. Thomas scored 17 points and played 19 minutes in his first game in seven months, an impressive return. Thomas added three 3-pointers and three assists before leaving with 8:10 left and the Cavs up by 12. LeBron James scored 24 points, Kevin Love had 19 and Jae Crowder added 15 for the Cavs. Thomas, who finished 6 of 12 from the field, knocked down a jumper, then fired a pass toward the baseline to a cutting Dwayne Wade, who made a reverse layup. On Cleveland’s next possession, Thomas spotted up in the corner in front of Cleveland’s bench and buried a 3-pointer for a 100-91 lead. A few moments later, James was sent in for Thomas, who first got a hug from his teammate and another from Coach Tyronn Lue as the crowd roared. Thomas hadn’t played since May 19 because of a torn labrum in his hip that ended his 2017 postseason with Boston and threatened to derail his career. But the 5-foot-9 playmaker, who inspired the Celtics and an entire city last year, patiently stuck with his rehab. With 4:33 left in the first quarter, Thomas, wearing his familiar headband and No. 3, checked in to a loud ovation as Cleveland fans finally got to see a player they believe can help the team win a fourth straight Eastern Conference title. Thomas picked up a quick assist with a pass to Crowder, who came with him from Boston in the summer trade that sent Kyrie Irving to the Celtics and shook the NBA. Thomas drained his next shot, a pull-up jumper from 14 feet, and then made one of his signature moves. Driving the lane past Portland’s Shabazz Napier, Thomas dropped in a left-handed scoop shot while being fouled and crashing to the floor beyond the baseline. SPURS 100, KNICKS 91: LaMarcus Aldridge scored 29 points, Kawhi Leonard had a season-high 25 and San Antonio won at New York to give Gregg Popovich sole possession of fifth on the NBA’s coaching wins list. LAKERS: Guard Lonzo Ball and center Brook Lopez were cleared to return to practice after recent injury absences. They are both questionable for the Lakers’ game Wednesday night against Oklahoma City.